Mayonnaise isn’t just a condiment or for sandwiches! 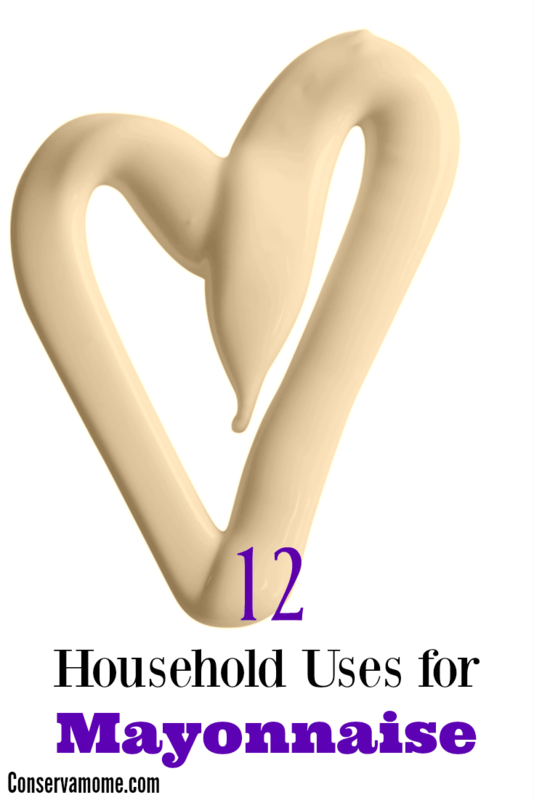 Check out 12 household uses for Mayonnaise! Clean Stainless Steel: If you have some appliances that are smudged up, grab your mayo and a rag. Just add some mayo to rag, and buff your stainless steel. It will remove smudges and leave it shining. Relieve Sunburn: Don’t have any aloe vera on hand, try using mayonnaise in place. Just apply on skin and let it sit for 30 minutes. Then shower. Deep Condition Hair: If you have really course hair or deal with dandruff think of deep conditioning with mayonnaise. Just apply a nice layer to scalp and hair. Then let it sit for 25 minutes and then rinse and wash. It will really moisturize scalp and hair. You can do this when needed. Gum in Hair: Grab that jar of mayo, and rub it in and around the gum. Work it with your fingers and the gum will slowly come out of hair. Head Lice: Get rid of head lice naturally. Apply a layer of mayo to the scalp at bedtime, and place a shower cap over head. When you wake up comb hair and wash as you normally would. Faux Houseplants: Have fake houseplants that are a little dusty. Dust the plant first, then on a new rag add a dab of mayo, then wipe the leaves. It will add incredible shine to the plant. Remove Crayon from Wall: Have a kid who colored on the wall?! Take some mayo apply a layer over the crayon mark and let it sit 10 minutes. Then wipe it away and it should remove the crayon mark on wall. Soak Nails in Mayo for Mani: If you are going to give yourself a manicure, grab a bowl of mayo. Soak nails for five minutes, and it will help moisturize nail and soften cuticles. Just wash off, and pat dry, and then paint nails. Remove labels from Containers: If you re-purpose old containers, then here is a tip for getting that glue residue off. Peel off the label as much as you can, then lather a thick layer of mayo on. Let it sit for five minutes, and that will have the fat in mayo work at eating that glue away. Then rinse away, you can repeat this until all the glue residue is gone. Works great for bumper stickers and other things with glue residue. Ring Stuck on Finger: Apply some mayo around the ring and it will help it to slide right off. Water Stains on Wood: If you have water stains on wood, apply some mayo to the area. Let it sit ten minutes, and then wipe away. This will help to remove the stain. Facial: If you have really dry skin try creating a facial. Apply a thin layer of mayo to your face and let it sit 15 minutes. Then wash face after, and pat dry. Looking for more life hacks? Check out 18 uses for rubbing alcohol! These are all great tips! I’ve used mayonaise for removing glue from plastic & glass jars and it works great! I never thought to use it for shining up my pots & pans. Thanks for sharing!! Laughed till I was crying on that remark. Great ideas, I never thought of doing a facial with mayo, or removing gum with it. These are great ideas–I didn’t know most of these. Thanks! I’ve heard of mayo as a hair mask. However, using it to get gum out of hair is a new one! Oooh this is very interesting!! I didn’t know many of these!! Especially the head lice one!! Whoulda thunk it! !